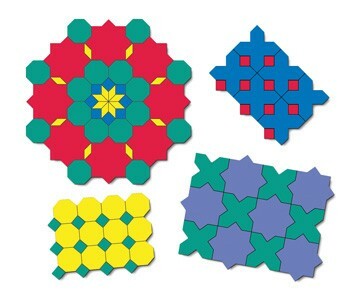 This geometric puzzle featuring octagons and octagrams (8-pointed stars) was inspired by Islamic art. The octagram and cross tessellation has been used architecturally since at least the 13th Century. The puzzle also contains squares and rhombi. Edges lengths are 1", making the pieces compatible with Tessel-Gons and Tessel-Gon Stars. Ages 6 to adult. 160 magnetic foam pieces.